After our day on a wine tour we wanted to try see as many places as we could along the northern point of the South Western coastline. A lot of the places don’t have much there so we hopped from town to town exploring. Because we did more looking than actually doing activities this will mainly be a photo post of what we saw with little notes of anything of interest. First stop was a very small seaside resort called Yallingup. Apparently the name translates to ‘place of love’. While stopping to look out at the coastline we saw a couple that we had been on the wine tour with the day before which was lovely. 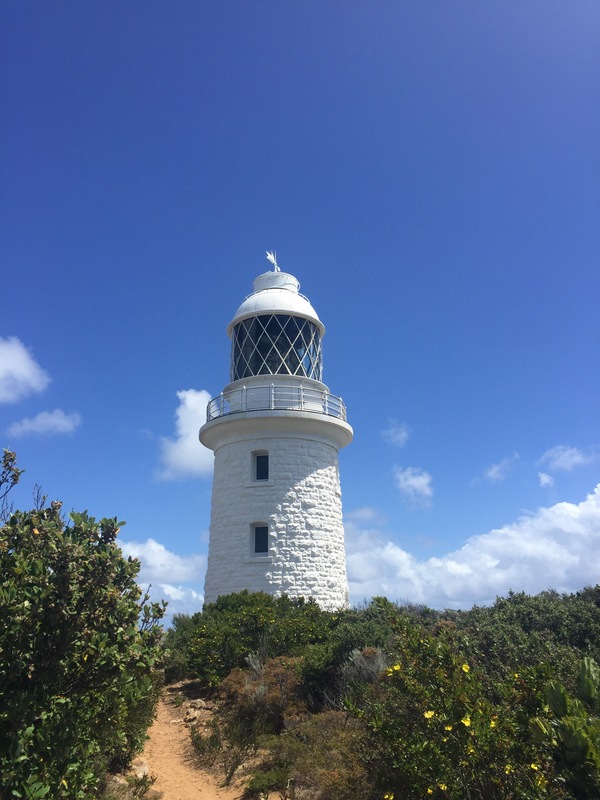 Our next stop was to Cape Naturaliste which is part of a national park and has a small, quite wide lighthouse. You have to pay to go up the lighthouse and only by guided tour so we didn’t bother. I don’t have any pictures but we stopped off in a town called Dunsborough for lunch. It’s pretty big but just looks like a normal town. After lunch we drove along the Geographe Bay and stopped at different points along the coastline. It’s a very shallow, pretty beach with clear waters. Apparently it can be a good place to see whales and dolphins but we didn’t see any. Th town of Busselton was our next stop and one of their tourist attractions is a long jetty that is 1.8km long so we walked along that. It was really windy so probably not as picturesque as it could have been. People were fishing along it and there is a little train you can get to take you to the end and back – we didn’t use this! At the end there are drawings of the different types of whales in the areas drawn to scale and you can see just how huge they are! On our way back, and also a place we passed when we first drove down to Margaret River, is a place called Coweramup. This is a very small town but has loads of model cows everywhere. Apparently they commissioned an artist to make loads of cow models and they’re all over the town. It was quite surreal the first time we saw this, late at night, when we were travelling down to Margaret River. I think they have also broken the record for the number of people in one place in a cow onesie too – only in Aus! Bunbury was another town we visited along the South West coastline. This is one of their bigger towns (they call it a city but it didn’t really seem like one). It is meant to be a good place for dolphin spotting but we didn’t see any, possibly because of the time of day we arrived there. Bunbury has lovely beaches with free BBQ’s all along it – we saw quite a few families bringing food and having a BBQ. I bought a ‘shaved ice’ which is really similar to a snow cone and was a lot bigger that I expected. It was really good! It was great to see a lot of the places Western Australians are living. Some of the places are a lot more remote than others so I don’t think I could live in many of them! It must be lovely to have beaches so near you with a lot more warm weather so that you can spend your evening having BBQ’s on the beach! 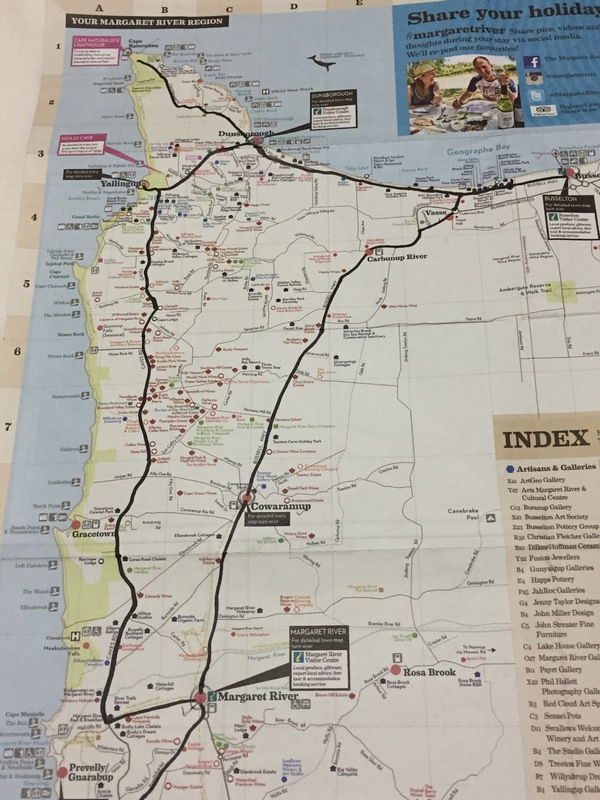 Having the car made this so much easier and there were probably a lot of places we wouldn’t have been able to see at all (a lot like if you wanted to explore Northumberland) so having a car is a must if you want to go to Margaret River. My next post will have more news on what we have been doing lately.